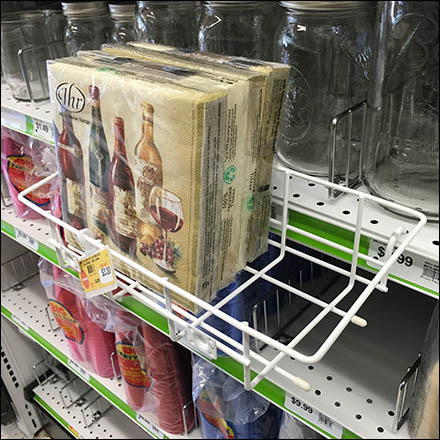 Don’t limit your thinking to a single cross sell, when Double-Wide Open Wire Tray for Shelf Edge are available as necessary. Lucky this one was stocked singly, so as to all the better demonstrate the extra width of the fixture. Labeling is by plastic Hang Tag. Zoom in to see the arched Mount Arm and compare with alternative linked in the Double-Wide Open Wire Tray for Shelf Edge gallery of images. Seen at Party City.